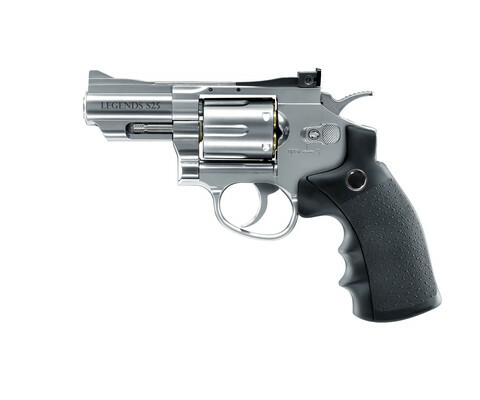 A truly high-quality revolver, all-metal, with a shiny nickel-plated finish: The three models in the Legends series, S25 (2.5 inches), S40 (4 inches) and S60 (6 inches), differ only in their barrel lengths. For authenticity they have six loading shells, each for one pellet, and a rifled barrel for accurate shooting. The rear sight is adjustable, and the barrel lock serves as a safety when pushed in the opposite direction.